Another routine job is cleaning the many valuable stone bracelets belonging to the Queen. Some of these are reset to make them fashionable, and often they are pierced with a tiny hook and can be rearranged by a clever adaptation on a skeleton fastening. Of late the Queen has taken an interest in the collection of necklaces of uncommon design. These she keeps in a corner cupboard in one of the sitting-rooms at Buckingham Palace, on shelves covered with black velvet, which shows them off admirably. 1. 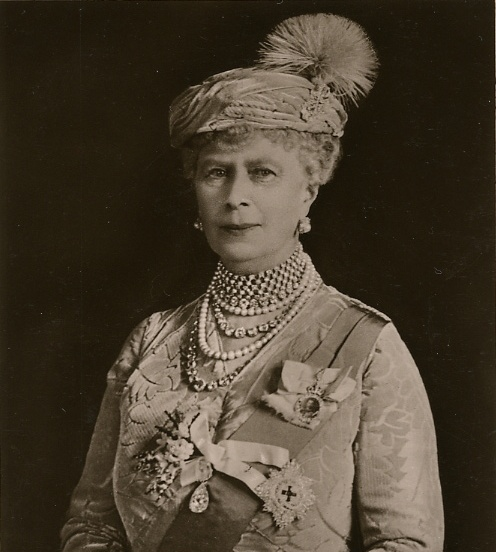 Queen Mary of the United Kingdom (1867-1953), born Princess Mary of Teck, was the consort of King George V of the United Kingdom. Born in Kensington Palace, her parents were Prince Francis, Duke of Teck and Princess Mary Adelaide of Cambridge (who was a first cousin of Queen Victoria). She was the mother of two British kings, Edward VIII and George VI, and the grandmother of Queen Elizabeth II.